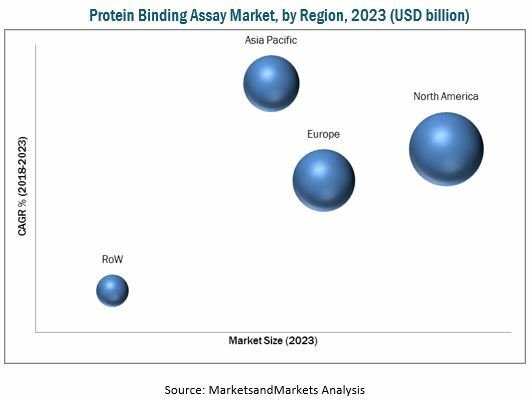 [97 Pages Report] The protein binding assay market is projected to reach USD 425.7 million in 2023 from USD 231.3 million in 2017, at CAGR of 10.7% during the forecast period. The base year considered for the study is 2017, and the forecast for the market size is provided for the period between 2018 and 2023. The global shortage of novel drugs and the demand for advanced drug therapies have both increased the focus on drug discovery. Most pharmaceutical and biotechnology companies are striving to cater to the demand for new drugs, leading to an increase in drug discovery activities. According to Statista, around 7,493 drugs entered the preclinical stage in 2017; this number is expected to reach 8,040 in 2018. This is translating into an increase in the total number of drug candidates being screened every year. Protein binding studies, carried out during the early stage of drug development, are a major part of the preclinical process. The discovery and development of a drug is a very cost-intensive process as it requires major investments in terms of capital, human resources, and technological expertise. It also requires strict adherence to regulations on testing and manufacturing standards before a new drug can be prescribed to the general population. Moreover, if the drug fails in the later stages of development, the entire investment is lost. Thus, to avoid such late-stage attritions in drug development, pharmaceutical companies are investing extensively in early stage, preclinical testing methods. Top-down and bottom-up approaches were used to validate the size of the global protein binding assay market and estimate the size of various other dependent submarkets. Major players in the market were identified through secondary research and their market presence was studied through primary and secondary research. Secondary research included the study of the annual and financial reports of top market players, white papers, medical journals, certified publications, articles from recognized authors, directories, and databases such as Statista, WHO, OECD, American Association for Clinical Chemistry (AACC), European Federation of Pharmaceutical Industries and Associations (EFPIA), International Trade Association, NCBI, and National Health Service (NHS). Primary research included extensive interviews with key opinion leaders such as CEOs, directors, and marketing executives. The percentage splits, shares, and breakdowns of the segments were determined using secondary sources and verified through primary sources. This data is consolidated and added to detailed inputs and analysis from MarketsandMarkets and presented in this report. The key players operating in the protein binding assay market are Thermo Fisher Scientific (US), GE Healthcare (US), Danaher (US), and Merck (Germany). The global protein binding assay market is projected to reach USD 425.7 million in 2023 from USD 256.1 million in 2018, at CAGR of 10.7% during the forecast period. Market growth is largely driven by factors such as the growing number of drug discovery activities, increasing pressure to reduce drug discovery and development costs, and the increase in pharmaceutical R&D expenditure. The growing CRO industry is also expected to provide a wide range of growth opportunities for players in this market. In this report, the market has been categorized based on technology, end user, and region. On the basis of technology, the protein binding assay market is segmented into equilibrium dialysis, ultrafiltration, ultracentrifugation, and other technologies. In 2018, the equilibrium dialysis segment is expected to account for the largest share of the protein binding assay market. The large share and high growth rate of this segment can be attributed to the advantages associated with the use of equilibrium dialysis, which include physical simplicity, low costs, and high accuracy. The simpler workflow equilibrium dialysis also makes it the preferred choice for protein binding studies. On the basis of end user, the protein binding assay market is divided into pharmaceutical & biotechnology companies, CROs, and other end users. CROs segment is expected grow at highest CAGR during the forecast period. The adoption of protein binding assays in CROs is mainly driven by the need for cost-effective protein binding services. Issues concerning existing technologies are a major constraint for market growth. In silico-based prediction models are also expected to challenge market growth to a certain extent. The key players operating in the protein binding assay market are Thermo Fisher Scientific (US), GE Healthcare (US), Danaher (US), and Merck (Germany). A majority of leading players in the protein binding assay market focus on both organic and inorganic growth strategies such as collaborations, partnerships, acquisitions, and agreements to maintain and enhance their market share in the protein binding assay market.